If it's not already at the top of your bucket list then the Great Barrier Reef is about to be, with an incredible endorsement from the world's most famous naturalist - Sir David Attenborough. The renowned English broadcaster has said that it is the most memorable place he's ever visited and at 89 years old, you know he's seen it all. Having first visited the reef almost 60 years ago, Attenborough has now made it the subject for his ground breaking new BBC series. While a lot has changed since Sir David's first dive of the world's largest coral ecosystem back in 1957, what hasn't changed is the sheer beauty and magnitude of the reef. Covering over 30,000 sq km the Great Barrier Reef is the only living thing visible from space and is bigger than the Netherlands, Switzerland and the UK combined. So if you too want to do a Sir David, there's plenty of opportunity to explore this natural wonder. Located off Australia's north-east coast, the Great Barrier Reef is a coral kingdom home to more than 1,500 species of fish. While there are multiple diving off points off the coast of Queensland, the Whitsundays are the most common place from which to explore the reef, with Hamilton Island being the most popular. Easily accessible, Hamilton is the largest of the inhabited Whitsunday islands and is also the only one with an airport. A holiday on Hamilton Island is an easy affair, with free WiFi island-wide and a cashless system that allows you to charge everything from ice cream to a cuddle with a koala to your room. The island even offers its own app to allow you to sign up for a full range of activities including beachside bingo and mini-golf as well as browse the different dining spots on offer. While all the activities offer a welcome break from the sun, sand and surf - let's face it, you're here for one thing. 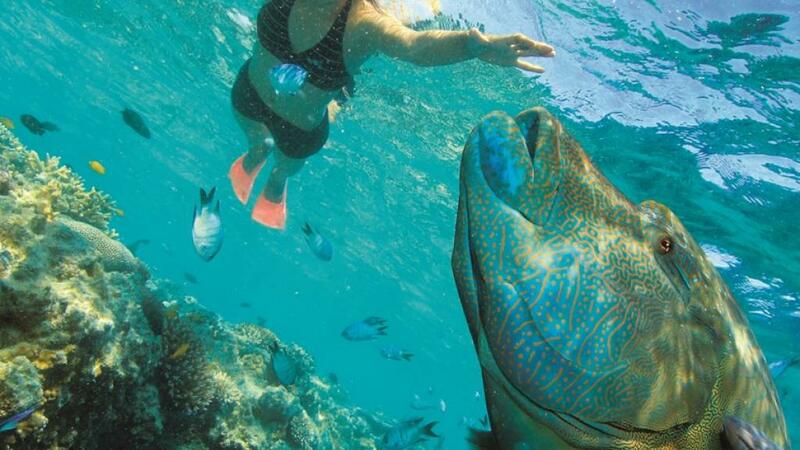 So if you're keen to find Nemo as well as a plethora of other marine life, arrange a day trip to the reef. Even if you've never snorkelled before, the friendly tour operators can give you a crash course in the basics on your way out on the boat meaning you're ready to take to the water as soon as you reach the reef. About 2 hours from Hamilton Island, Bait Reef is one of the more popular outer reefs which offers an incredible array of fish and a kaleidoscope of coral which looks like anything from tree branches to brains and neon fairy lights. Immersed in this incredible underwater world will give you an Attenborough-esque enthusiasm in no time.